Interested in saving 20-50% on shipping and taking multiple steps out of your shipping process? If so, then maybe Stamps.com is right for you. In this guide, we tell you what Stamps.com is, who it’s right for, how much it costs, and how it all works. 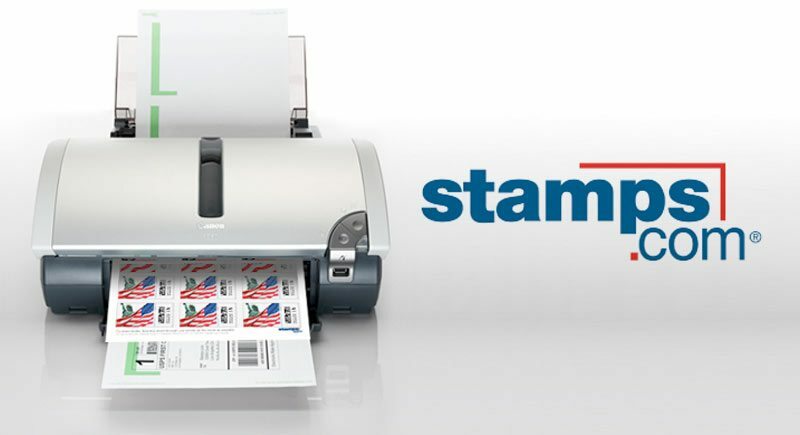 Stamps.com enables you to buy postage at discounted rates, print mailing labels using a normal printer, and automatically calculates the most cost effective shipping option. Using Stamps.com you can also schedule free USPS package pickups from your computer, avoiding trips to the post office. Particularly important to ecommerce companies, Stamps.com enables you to seamlessly import name and address information from other systems like Amazon, eBay, Shopify, and Etsy. How Does This Differ From Using A Postage Meter? With Stamps.com you do not have to buy or rent an expensive postal meter which can cost hundreds of dollars per year. Many postal meters don’t integrate with third party systems like Amazon or calculate the most cost effective shipping option. You cannot schedule free pickups online using a postage meter. How Does This Differ From Using USPS.com To Print Postage? You can print postage online using a normal printer at USPS.com as well, BUT only for priority mail products. With Stamps.com you get the same savings on priority mail products and can also get discounts on other types of mail which are not available from USPS.com. USPS.com is also much clunkier to use than Stamps.com and you have to enter your shipping information manually for each package. Who Is Stamps.com Right For? If you are going to the post office more than once a week, or spending more than $100 a month on postage, then Stamps.com is likely a good product for you. All plans come with a free Stamps.com postal scale that automatically sends information to your stamps.com profile for each package/item weighed. The pro plan should suffice for most small businesses. 1 user, unlimited packages, up to 10% discount on USPS insurance rates, customizable labels, maximum postage balance of $500, 10 cost reference codes, and much more. For a full comparison of plans, prices, and features, check out Stamps.com’s plan comparison page. Go to Stamps.com and input in the item type (letter,box, etc), item dimensions, item weight, preferred delivery speed, ,ship-to address, and insurance needs (if not already imported from online store). If you are using a Stamps.com scale and have already boxed the item, you can weigh the package and have the information sent directly to your stamps.com account/profile. Based on the item data you input, Stamps.com will automatically select the cheapest shipping method that meets all your specifications and apply the online discount. If you would prefer a different method, or already have an item boxed, you can of course select the appropriate method and override their recommendation. Once you have selected a shipping method, the balance will be added to your account. Then, an email will be automatically sent to the customer with tracking number and shipping information for their package. You can then view your label and customize it, adding your logo and business slogan if you want. Now you need to print off the label, which you can do using a standard printer and ink or a specialized label printer. Lastly, you attach the label to the package using standard packing tape. Just be sure not to cover up the actual shipping barcode with tape, that needs to be clear so that your mailman/post office can scan it. You can schedule a pickup that occurs during your regular mail route, as long as you schedule the pickup the day before via USPS.Com’s Schedule a Pickup page. Or, you can also take packages down to your local post office and just drop them off. If your company does a lot of shipping, it may be well worth paying the $15-$40 per month to use a service such as Stamps.com. If you do over $500 in monthly shipping expenses, you can even basically get the service for free with your $34.99 voucher. Whatever the case, you now have the important information you need to determine whether or not Stamps.com is a good solution for your business shipping needs. Do you know of anyone that prints postage directly on envelopes that have a plastic window for the mailing address? We are having issues with the plastic melting in our printer. We would like to be able to print the postage and return address on the envelop and the mailing address will be showing through the plastic window. Or even anyone that prints only postage on an envelop with no plastic in the mailing window and gets a good quality envelope out of the printer. Our printer tends to wrinkle the edge of the envelope. Laser printers set the toner using heat and that’s why your window is melting or sticking. Inkjet printers don’t use heat, but the ink isn’t as durable. Stamps.com actually has a video covering this very issue, it might answer your question. Also, some laser printer envelope feeders crimp the envelope corner over time, it all just depends on your printer. I hope this helps! Hello my office buys 4 rolls of stamps about every month and a half. Would we be better off using stamps.com would that save us money?? So if I’m sending out packages with priory and first class do I get automatically discounted when I print out the label or is it all discounted already? Both PayPal and Stamps.com give you the USPS Commercial Base Pricing (CBP) rates, which are less than you pay when you go to the Post Office. To get the lower Commercial Plus Pricing (CPP) via Stamps.com, you have to be a volume shipper with an agreement with the USPS. If you ship often, you might try ShippingEasy, they give all users access to Commercial Plus rates without the USPS agreement that Stamps.com requires. I hope that answers your question! So we need a printer that will print on the various sizes of envelopes we use, and/or labels that can be fixed to the envelopes. Can we print a label that includes a tracking number? Is that extra? How does the stamps.com price compare for say a 2lb envelope full of documents being sent out to the USPS flat rate price of $6.65 for anywhere in the US? If you use various envelope sizes, you’re best using a mix of stamp labels and a standard 4×6 label printer. You can print stamp-sized postage for #10 envelopes and full 4×6 labels with address, postage, and tracking barcode for larger pieces. With most shipping software systems, Stamps.com and USPS online, USPS includes tracking numbers for all Priority Mail, FCM, and Standard/Parcel Post at no extra charge. You typically need a 4×6 printer to include it all on one label. For the comparison, that will depend on the zone. You might spend less than flat-rate shipping within your zone, but more for a piece traveling across several zones. That’s why comparing pricing for these pieces is a good idea.